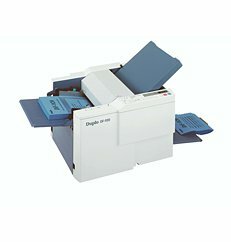 Duplo’s DF-915 Automatic Tabletop Folder offers high-speed folding up to 280 sheets per minute. With six popular pre-programmed folds and a multitude of custom folds, crisp and accurate folding for a variety of applications is accessed at the touch of a button. The patented feed system ensures reliable feeding and accurate folds for a wide range of popular paper sizes, weights, and stocks. No manual adjustments are needed, as the DF-915 automatically recognizes five popular paper sizes – letter, legal, ledger, 1/2-letter, and 1/2-legal. The Duplo DF-915 also features automatic settings for six popular folds, two programmable memory settings for custom folds, and “cross folding” for right angle folds. High-speed folding can’t get any easier. Simply load the feed tray up to 500 sheets, select the fold type, and hit start. The DF-915 is the fastest, most easy to use tabletop folder for all applications demanding speed and precision folding. Duplo’s DF-920 fully automatic tabletop folder can take care of all your folding needs. With high-speed folding up to 280 sheets per minute, folding has never been easier! With six popular pre-programmed folds and a multitude of custom folds, crisp and accurate folding for a variety of applications is accessed at the touch of a button. The DF-920 features unique sound absorbers inside the machine to dramatically reduce the amount of sound not only when folding but also when fold stoppers are moving, makes this an ideal machine for all businesses and organizations. The patented feed system ensures reliable feeding and accurate folds for a wide range of paper sizes, weights, and stocks. No manual adjustments are needed, as the DF-920 automatically recognizes five popular paper sizes – letter, legal, ledger, 1/2-letter, and 1/2-legal. The fast set-up mode allows the DF-920 to automatically recall the last job, all the user has to do is simply load the automatic elevating feed tray with up to 500 sheets, select the fold type, and hit start. A four-digit counter may be set to ascend or descend and two programmable memory settings are available to store custom folds. Additionally, the batch mode allows the operator to input the exact number of sheets to be folded in each batch. The DF-920 features an automatic jam detector which immediately stops operation to prevent damaging the machine. The Duplo DF-920 is the fastest, most easy to use tabletop folder for all applications demanding speed and precision folding. If you have any questions or are interested in purchasing the Duplo DF-915 Automatic Paper Folder, or the Duplo DF-920 Automatic Paper Folder visit us at SpiralBinding.com. We have great pricing on a full line of Friction Feed Paper Folders. Call us at 1-800-631-3572 for more information!